Home > History	> Who is Addai? 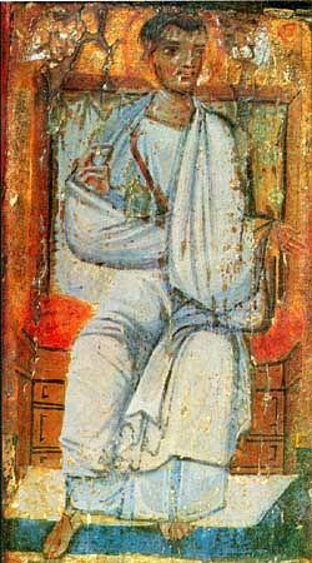 Semitic name Addai, abbreviation for Adonija, does not derive from a person of the New Testament. It is necessary to wait until Eusebius – secondary source compared to the Doctrina (Illert 2007: 20) – to identify him with Thaddeus, one of the twelve Disciples (Matteo 10,3 / Marco 3,18) (HE I 12,3). According to the Doctrina, Addai came from “Panea, at the springs of Jordan River” (Howard 1981: 42s). The position against the conjecture that this is a reference to the Gospels is supported by the different name used in the Bible. As a matter of facts, it mentions the place as Caesarea Philippi (Marco 8,27 / Matteo 16,13). Because of this detail, Theodor Zahn’s position is still convincing. He presumes that «since it is totally impartial, this should be considered as a trustworthy tradition through the first, or one of the first, preachers of Christian faith in Edessa» (1881: 369). A significant role into the Doctrina is played by James the Brother of the Lord (Howard 1981: 22-25. 34s). Yet there is a pre-existent source connecting James with Addai. According to the First Apocalypse of James, the Brother of the Lord had instructed Addai. The Gnostic apocryphal text in Coptic language brought to us, that we know also from the recently (re)published Codix Tchacos, contains Jewish-Christian translations and can be dated back to the 3rd century (Brankaer/Bethge 2007: 114-117; 84s). Richard Bauckham assumes that there had been a mission of the Family Members of the Lord towards East (1990: 66-70) and that Addai, before the year 70, had relations withJerusalem. Richard Bauckham also gives the Apocalypse of James for sure (2008: 265). Also M. L. Chaumont considers the Mission of Addai a verified historical fact (1988: 14-16), but, like Adolf von Harnack (1924: 681), he places it in a later period of time, around the year 100. Interesting. Of course no one in the Church has ever accepted the apocryphal writings as history or necessarily historical. To use them to determine historical fact apart from the authority of the Church would be misguided, in my opinion. Sampath, the risen Christ would not have given a burial cloth to the servant of the priest, of all people. It was an unclean object. Thank you Louis. I don’t know why we can read that sort of statement in Gnostic gospels. According to my understanding Jesus never consider anything as unclean like humans do. Jesus touch all sort of untouchable people. So there must be a reason why Gnostic gospels have mentioned the Shroud in second century and not the canonical gospels in the first century. As such I don’t want to ignore gnostic gospels as today many people can identify Shroud as a genuine object. Furthermore today many Churches are not only discarding Gnostic Gospels but also they discarding the Shroud. You are right about Jesus’ attitude. To provide an example, he lodged in the house of Simon the leper, in a leper colony, while he was on his way to Jerusalem on one occasion. The Israeli archaeologist Yigael Yadin, who was convinced that Jesus was anti-Essene, thought that he did it on purpose in order to show the group what he thought about their views on rituals of purity. That was typical of him, one way of demonstrating what God’s love meant. Now, that does not mean that others agreed with him, particularly the Sadducees, who were the priests controlling the Temple. As for the Gnostic gospels, they have to be handled with care. They were written after AD 150, many of them also used the canonical gospels as sources, including the Gospel of Thomas. When it comes to their dualism a big problem is encountered. Studies are being made by respected European scholars, concentrating on a new way of understanding Christology, which may go to explain why the gnostics thought the way they did. What is called mysterium Christi began in the first century and continues till today. Louis you are a very good resource person. Thank you very much. You’re welcome, Sampath. I’ve been a Religion Writer for around twenty years. New Book on the Shroud of Turin Why Not Luigi Garlaschelli?